With only a short period of time to wait until he can make his final hire, head coach Dan Mullen‘s initial Florida Gators coaching staff is basically set. 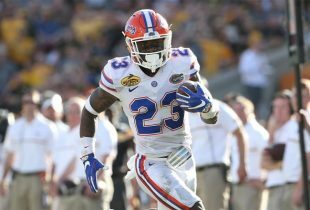 Over the last few days, Florida has announced the hirings of Sal Sunseri, Greg Knox and Christian Robinson to unspecified positions. 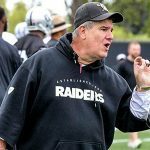 Sunseri, 58, will join Florida as Mullen’s defensive line coach, according to long-time NFL insider Adam Caplan. It has also been speculated that he could coach outside linebackers. A veteran assistant with an extensive resume, Sunseri began his career at his alma mater Pittsburgh in 1985 and even served as the Panthers’ interim head coach in 1992. He was on Nick Saban’s first LSU staff as linebackers coach and special teams coordinator in 2000, moved to Michigan State for a year (2001) and then led the Carolina Panthers’ defensive line for six seasons (2002-08). Saban rehired Sunseri as assistant head coach and linebackers coach at Alabama (2009-11), and he only left for his first shot at being a defensive coordinator at Tennessee in 2012. After Derek Dooley got fired by the Vols, Sunseri moved over to Florida State as defensive ends coach (2013-14) and helped lead the Seminoles to a national title. He’s spent the last three seasons as linebackers coach with the Raiders. After four seasons as a graduate assistant, Knox took his first job in 1992 as wide receivers coach and special teams coordinator with Stephen F. Austin. He moved on to coaching receivers and running the recruiting operations for Ole Miss (1995-98) before taking the same job at Auburn (1999-2008). Mullen hired Knox in 2009 to coach running backs at Mississippi State in 2009 and added the special teams coordinator role in 2014. Knox most recently served as the Bulldogs’ interim coach for their bowl game. Robinson, 27, is a former Georgia linebacker who has spent the last five years as a graduate assistant at UGA, Ole Miss and Mississippi State. His Twitter profile lists him as the inside linebackers coach, making Florida his first collegiate coaching job. He is also the youngest member of Mullen’s coaching staff. 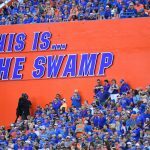 Though not a coaching staff position, Mullen will also have to replace a crucial staff members as director of player personnel Drew Hughes will be moving on from Florida to SEC East rival Tennessee, according to FootballScoop.com. Hughes had been in his position at UF since the Will Muschamp regime and has done a tremendous job for UF during his time in Gainesville. Let’s take a look at the Gators’ coaching staff as it stands now. Positions with ^ are known, those with * are projections.